Sanuk Games' Bombing Bastards Touch! 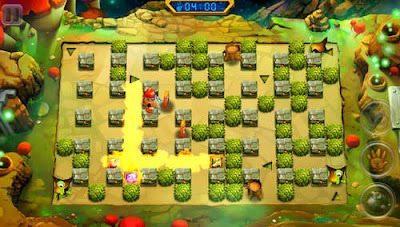 is basically a Bomberman clone designed for touch screens. It was previously an Android TV exclusive but now has been released to other touch devices with revamped controls. The game is centered on solo play through its 5 levels of total explosive arcading fun! With 30 killer mazes, epic boss fights, special attacks, power-ups, all colorfully designed, you'll instantly get addicted! Bombing Bastards: Touch! mod apk include enemy freezing, x3 speed for players, Boom fire max ranger, Boom put max 85, Boom fuse 3s hacks and more to come. You can play using many touch control schemes. Either with tactile selection buttons or with dynamic buttons. They still suffer from bugs but the devs are working hard to fix them. Now grab the unlimited money apk and join Dr. Wallow in some bomberman quests, collect items, blow up stuff, but don't get blown up!